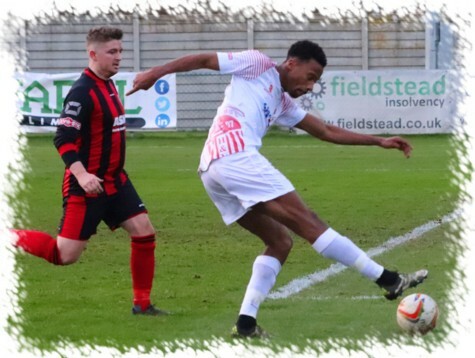 Hayes & Yeading’s winning run in the Evo-Stik South, East Division stretched to five games as an Ismael Ehui second half header was enough to earn maximum points against another in-form side Thame United at their ASM Stadium. The first chance of the afternoon fell the way of the visiting United as Laste Dombaxe chased a deep cross all the way to the touchline, having kept the ball in play he fired it to Ismael Ehui in the box, his knock down fell to Toby Little who nudged the ball right to the on-coming Adam Cash who saw his shot loop up and onto the roof of the Thame net. 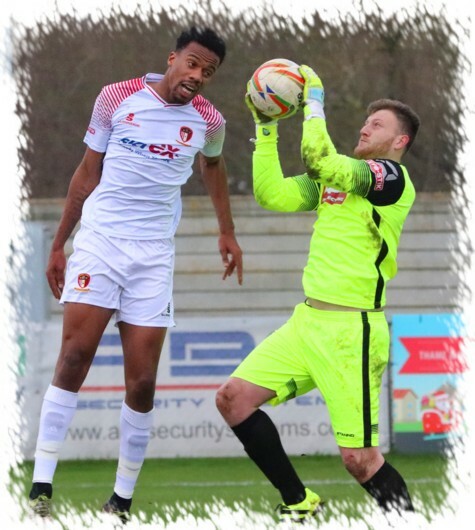 First to try his luck for the home side was Dan West, the striker’s somewhat weak shot being held easily by Barnet loanee ‘keeper Kai McKenzie-Lyle. Play soon switched to the other end and again Dombaxe was involved in a neat build up, this time his cross found Manny Duku who saw his looping header being tipped over by home stopper Craig Hill. Play had a quick spell with both sides creating openings in quick succession of each other. For the home side Lynton Goss burst into the United box on the left side, his rasping drive being held high by the strong hands of McKenzie-Lyle. The ball was immediately played to the other end of the field where Ehui collected it and moved into the left side of the Thame box, his curling drive being well pushed away by Hill. The half closed out scoreless but not before the visitors created two more openings. Ehui met a Little centre at full stretch but couldn’t divert the ball on to the target and then as stoppage time commenced, Ehui played Duku in, the striker shooting from a tight angle only to be denied by Hill who pushed his shot to safety. The second half started with a half chance for the home side as McKenzie-Lyle allowed a West free-kick to slip between his hands for a corner although the ball looked to be going over anyway, such is the United ‘keepers reach. Minutes later a game of head tennis by Paul Hughes’ side saw the critical opener arrived courtesy of a tenth strike of the campaign from Ehui. 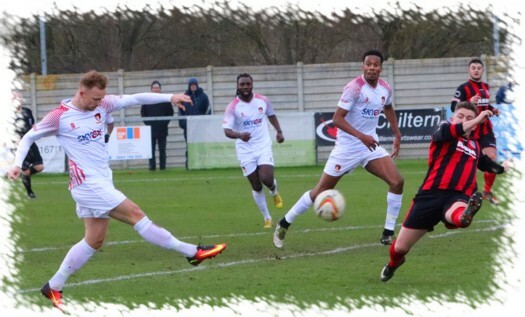 A deep Cash cross was headed back into the mix by Ryan Kinnane from beyond the far post, subsequent headers from Dombaxe and Duku took the ball nearer the target where Ehui pounced to head past Hill from close range. A twenty minute lull in close encounters followed with neither ‘keeper having anything out of the ordinary to do. The final twenty minutes saw a few more gaps open as tiredness and the need for the home side to push on at United saw more chances created but none were really gilt edged. Duku hit the side netting from a tight angle having collected another well delivered Cash pass and this was followed quickly by a surge forwards by Little that ended with Hill fielding his eighteen yard effort. For the home side, a speculative 35 yard effort from defender James McGowan was fielded by McKenzie-Lyle and a whipped in cross from the right by Calvin Evans thankfully for United evaded all and sundry in the centre before going out wide of the far post. Another quick switch from end to end nearly caught United out this time, Hill caught a Duku backwards header, that almost caught the stopper off his line, and he immediately launched the ball forwards to West who found space for a shot from 18 yards, McKenzie-Lyle though was more than equal to it and gathered the ball confidently. Five minutes from the end saw the last real opening of the game as a ball forwards sent Ehui away on goal, the Thame defence did well enough to catch him and force him across the area, he then fed the ball back to Scott Donnelly who saw his 20 yard shot deflect inches wide of the target. 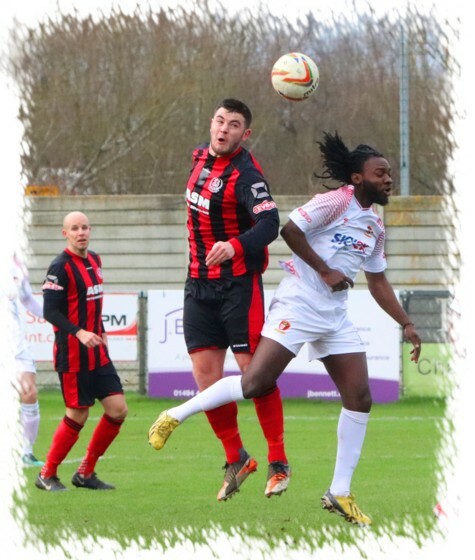 The subsequent corner was again met deep by Kinnane, his head back being met by substitute Tom Smith close in but his shot was blocked away by the Thame defence close to their own goal line as the game closed out on a single goal victory that pushes United up to fourth in the table.